At what age did you begin our toddler program? I began the toddler program when I was about 4 years-old. Do you remember anything special about that period of time? I always remember running to the piano at the beginning of class and trying to figure out the notes our teacher was playing! Did any particular event, or class, or repertoire from Harmony Road motivate you to aspire to become a musician? I think the Harmony Road course I participated in from a child to about 8th grade was what inspired me to become a musician. I enjoyed the classes and the opportunities we had to create our own music. Through the class I realized my passion for my primary instrument, the piano. This is a question I’ve gotten so many times in my life. I am primarily a piano player, but started on the viola at the very end of elementary school, entering the 6th grade. 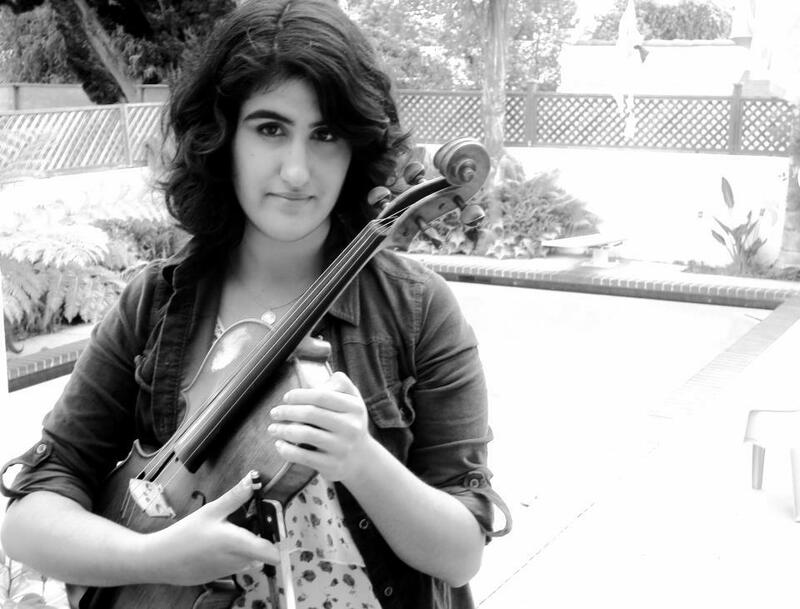 With the viola, I realized that there were so many new challenges and new ways to express myself through music. I realized my passion for playing the viola while playing in my school’s Symphony and Chamber orchestras. Through those, I began to pursue a goal of becoming a solo violist instead of just an orchestral one. What has made studying music so special to you? Music is everything for me; music is my passion. I always love listening to music whenever I have the chance to, and listening to it has a huge emotional impact on me. In reality I tend to be a very soft- spoken person when around others, so I have a hard time communicating with others. Music, however, is able to communicate to everybody, in different ways. I realized a while ago that communicating to others through music is just amazing, and by playing my viola and piano to others, I am able to carry out my greatest passion. Yes! Thanks to the ear training that is developed through Harmony Road’s music course. I also developed my ear quite a bit while in the choir program at my middle school. Most definitely. I am currently in an advanced composition class taught by UCLA professor Mark Carlson. I am a junior in high school. As of now I’m still researching music schools. At the moment my top choices are UCLA, Colburn, University of Bloomington, Indiana, New England Conservatory, Rice University, and Boston Conservatory. What musical groups do you participate in now? I am in the Symphony and Chamber orchestras at Santa Monica High School. Earlier in the year I was chosen to participate in the California All-State High School Orchestra, conducted by Maestro Jung-Ho. I also like to play in quartets and duets with my friends. Have you won any musical prizes? In 7th grade I won an award for vocal performance at the Kiwanis Solo Competition. Other than that I have received awards for getting superior ratings at the annual SCSBOA Solo and Small Ensemble Festival. Why did you stop piano lessons? I mainly stopped taking piano lessons because of my busy schedule along with school. I usually have rehearsals until 7 every other day at school, and I also have weekly hour and a half viola lessons, so I had to take out something. Fortunately, I keep up my piano playing in church, as I serve as the piano accompanist for the children’s mass at my church. Will you continue them in the summer months, at least? I hope to resume my piano lessons in certain months of the summer. I have a piano concerto that I’m almost done with that I’ve been dying to perform for ages! I’m also going to start teaching piano. What is your latest composition? My latest composition is one that I’ve been working on in a class I’m currently taking at UCLA. It’s a piece for piano, and the parts are beginning to fit together quite nicely. I’m also in the process of writing a piece for a string quartet. What are some of your memories of Harmony Road? I always remember cracking jokes during class to lighten the mood. I also remember playing the Can-Can upside-down and backwards. I also can’t forget the infamous Pillow Dance…dance routine my class performed a while back. Are you at all active in helping your younger siblings to enjoy the rigors of music education as you have? I try to help my sister with her saxophone playing, as well as my brother with his viola playing. I help them both with the piano. When I help them, I usually try to get them to get more into the music they’re playing, to treat their music as an expression rather than notes on a piece of paper. Gustavo Dudamel, Emmanuel Axe, Hilary Hahn, and Michael Giacchino. I have had the pleasure of meeting them all. What is your favorite composer? Composition? My favourite composer is Antonio Vivaldi. Composition…I really can’t decide. If you are going to major in music in college (are you?) then what do you want to be when you grow up? I definitely want to major in music. Right now I mainly want to be an orchestral musician, although I have discovered the possibility of being a studio musician. I also want to teach kids piano. How have your parents supported your love of music? Definitely. They’re the ones that started me at Harmony Road! Right now the path is really tough with college auditions around the corner, but my parents are with me every step of the way. What is your advice to music students at our conservatory? NEVER GIVE UP. EVER. Never worry if you aren’t getting a piece down perfectly. Practicing always helps. And try to have fun with music! Music is one of the greatest gifts of all, and I think being able to play music is even better. Mom and Dad: what thing or things do you feel marked the beginning of Silvana’s realization that music is her life? Dad: When she played music at home, without being prompted, for pure enjoyment and relaxation. M and D: Do you feel you did anything special to encourage this enjoyment of music? Do you feel that Silvana’s passion is hereditary or environmental or both? Dad: There could be a hereditary component, as there are musicians in Silvana’s maternal grandmother’s lineage (concert pianist and trombonist). We also listen to classical music at home and in the car quite a bit (possible environmental component). But I credit Cornerstone Music Conservatory, and Miss Annie in particular, for nurturing Silvana’s love of music. How many hours do you practice daily, weekly? I try to practice at least 2 hours a day on my own, excluding the 2 hours of rehearsal I have every other day. That’s about 14 hours a week. Do you have time to do your regular school homework and are you a good student? I will say that taking 6 classes while being in 2 orchestras is quite the challenge. However, this year of high school is the one that colleges look at the most, so I work hard. I am proud to say that this year, I have maintained above a 4.0 GPA by taking 2 rigorous college courses along with an honor class and three other classes. I’m a pretty good student. How do you organize your time so that you have time for all your music activities and your regular school work too? Unfortunately, I have to give up sleep a lot. I usually get home around 5 or 7, depending on if I have Chamber or Symphony rehearsals. I then do homework, practice for 2 hours, and then do more homework. On days when I don’t have as much homework, I like to draw, photograph, and write stories. Do you have other things you do as well? (sports, hobbies, community service, other classes)? I’m a published online author on a fiction website. I also draw digitally a lot, so I sometimes am commissioned to draw for others. I’ve just begun to explore photography and acting as well. I help out at my church a lot and teach some of the choir kids there piano and help them with their singing. I’m also a pretty environmental person, so I participate in a lot of land restoration activities and beach clean-ups. Lastly, I help with a lot of fundraising for an organization called Support Orphans Society.